If I were to credit one TV personality for my love of cooking it would be Emeril Lagasse. Watching Emeril on the Food Network back in the early 1990’s helped me hone my skills around the kitchen and come to see cooking as fun and not so much a chore. 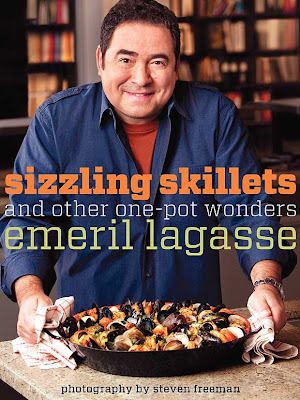 So obviously I was super excited to find out I was selected from more than 100 applicants to take part in Emeril’s One Pot Blogger Cooking Party to promote his upcoming book Sizzling Skillets and Other One-Pot Wonders. Thank you Morrow Cookbooks and the Secret Ingredient Club for including me in this wonderful group of 20 talented bloggers. So what does all this mean? Well for one thing over the next 3 weeks I’ll be cooking and blogging everything Emeril. I’ll be giving you the inside scoop on his new book, along with sharing some recipes, and offering you not one but two chances to WIN. Sound like fun? It does to me. Check back often starting September 12,2011- October 1, 2011 to take part in this awesome blogger party. Full disclosure: For my commitment to this blogger cooking party, I received a copy of the cookbook, as well as a set of Emeril – by zak! Table Art 7-piece Flame-Shaped Serving Bowls, and Emeril Seasoning; a $50 grocery reimbursement and Emeril cookbooks upon completion of the party. The top performing blogger, as selected by T-Fal, will be awarded an Emeril by T-Fal Slow Cooker. Congratulations on being picked! What a thrill for you! Congratulations! I will look forward to the blog posts. Congratulations! I can't wait to see what you cook up! One Pot Wonders.. Perfect! Can't wait to read your reviews of the recipes you try! Congratulations Theresa!